As you're perhaps aware there are two important caveats to Amazon's same day services in that only specific zip codes are covered and that for Amazon prime customers delivery is free for orders placed before noon local time which guarantees same day delivery by 9pm local time the same day. The specific zip code coverage is available here and it offers an interesting insight into the correlation between population density and the physical location of Amazon's fulfillment centers across the country, more of which we'll look at in a moment. Adding those three cities is a huge step for the online retailer and while the coverage doesn't include every conceivable suburb, the metro area populations for the cities rank 4th (Dallas) 8th (Miami) and 20th (Baltimore) nationally. This demonstrates a very methodical ongoing process by Amazon to capture key markets and the newest additions mean that nine of the top ten metropolitan areas now offer some level of same day delivery service. The only metro area not included at present is Houston which suggests that the Texan city is likely to be next on the list. 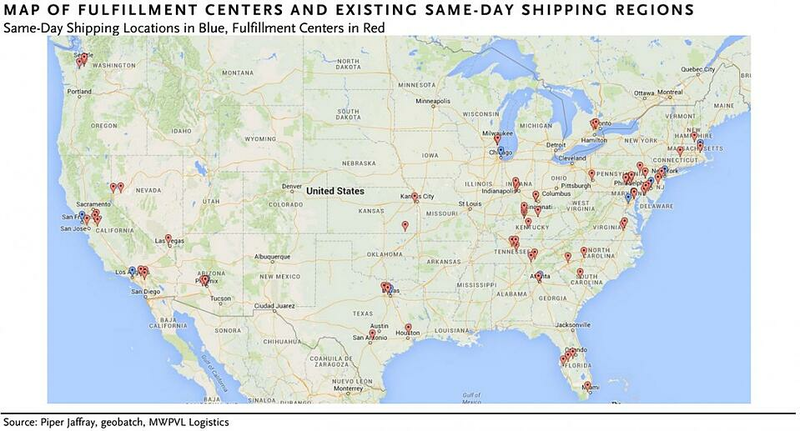 In fact, a very informative map reproduced above was created by Piper Jaffray which displays the locations of Amazon fulfillment centers and corresponding same day delivery markets. The most challenging large markets look like they might be Denver, Minneapolis and St. Louis due to the logistics involved. What will be very interesting to watch later this year is whether Amazon chooses to focus on adding new cities to the list of eligible metros or expanding the zip code coverage in the current markets seeing the most success with adoption of same day services. One other amazing statistic is that 31% of the U.S. population currently lives within 20 miles of a distribution center and that over 50% of addresses which are above the national median for household income fit the same criteria.